Technical Car Experts Answers everything you need: Brother CE4000 error code troubleshooting and user manual? Brother CE4000 error code troubleshooting and user manual? “Lower the presser foot lever before continuing the operation.” Is referring to the foot that holds the material against the plate as you sew. 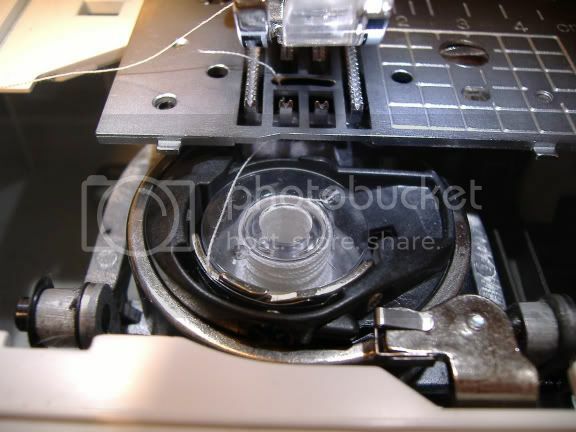 If you reach right behind the needle casing and slightly above (or slightly to the left or right) there is a little lever you flip down and it makes that foot click down in the holding position. That should take off the error message. did you lower the presser foot? do you know what it is? the foot you lower onto the fabric before you start to sew. I agree with turn off the machine, re-thread everything. check to make sure all plugs on in properly. and start from the beginning again. You do not use the foot pedal or the start/stop button. Once you move the bobbin toward the winder, the bobbin will start winding. If you pressed the start button or used the power/foot pedal to attempt to wind the bobbin, this is the reason you got the error message. I'm really hoping someone can help me with this. I've been searching online for hours with no luck, not to mention messing with my machine half the day yesterday, and I'm just going crazy! Like it says in the subject line, I have a Brother CE-4000, and I can sew about one stitch (if I'm lucky) before the bobbin thread gets tangled and the machine shuts down with an E6 error message. An interesting aspect of the tangle is that it seems to be different every time- sometimes it's tangled around the top thread, sometimes around the bobbin casing itself, sometimes just sort of wandering into the wrong place (as pictured below), and sometimes tangled around itself in knots. Not to mention the absolutely godawful noise it makes when this happens. I've had this machine since early 2007, so I'm pretty familiar with the basics of operating it (yes, I am quite sure I'm threading it right, and I am using the appropriate needle for the fabric) but I won't pretend to be super well-versed in how to fix machines. I just used it a couple of weeks ago, and everything was fine. The last thing I attempted to do (if it matters) was to fix a hole in a nylon shopping bag. That's when the trouble began, but it's not just the nylon that makes the machine do this. I've tried cotton, felt, corduroy, knit teeshirt material, and flannel all with the same result- tangle and error. I had a similar problem last year that cleared up with a simple cleaning, but that isn't working this time. Can anyone help? I'm desperate and completely frustrated. I'm hoping I don't have to take it to be serviced as we have no money right now and I need to sew for a swap...did I miss something simple? Pics of the bobbin casing included because a helpful person on Craftster suggested there might be a broken piece since it sounded like a problem she just solved on her own machine...it looks fine to me though, what do you think? 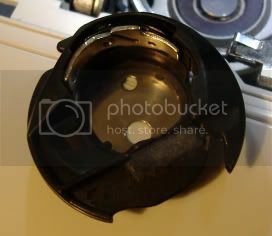 Did you also remove the throat plate and clean it? 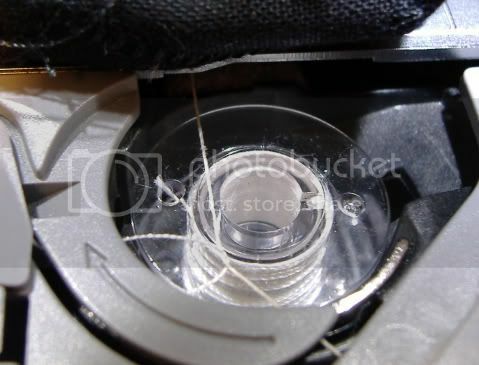 Also, run a thin piece of cotton through the tension discs to see if there's anything caught in there. It really sounds like there's some issue with your hammer (the thing that goes up and down) so take a stitch slowly and see what the thread at the hammer does. Is the thread caught in the tension so that it snaps at the hammer? Or does it go so slack it falls out of the hammer at the bottom? Then I tried to do it...the screws are NOT budging. Not one millimeter, not with all the strength I have. I'll have my husband give it a try when he gets home, but that's not for another 10 hours. I tried to find out where my tension discs might be, and I have to admit I have no idea, and my search was fruitless. I tried taking small stitches by turning the wheel by hand and closely observing, but it really seems situation normal up top. As soon as I started stitching the thread slipped out and started to knot, twisting around the top thread in the process. 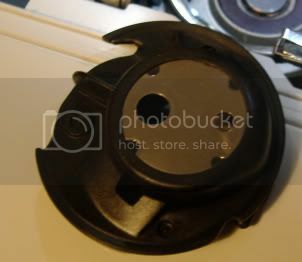 Have you tried using a metal bobbin instead of plastic? Sometimes, for reasons that I don't understand, but it happened to a friend, that can throw it off. What kind of thread are you using? It looks more twisted than ordinary sewing thread. Also, troubleshooting step #1, always: Change the needle. You can have a burr or nick so tiny you can't feel it, but it can still snag thread. Coats & Clark is Cotton coated polyester (I think it still is). Some machines hate this, because the cotton sheds off the poly core. Try 100% poly thread (metrosene or guttermann) and see if that helps. Also, is the bobbin unspooling the right direction? Labels: Brother CE4000 error code troubleshooting and user manual.